One of the cruellest torments endured by Byron’s Prisoner of Chillon was to glimpse through the bars of his cell breathtaking mountains with their ‘thousand years of snow / On high – their wide long lake below / And the blue Rhône in fullest flow’. The belated ‘compassion’ of his captors in loosening his chains, reminding him that paradise lay just beyond the dungeon walls, served only to deepen his despair, writes Richard Tarrant. Chillon Castle still stands, sentinel-like, beside Lac Léman, as does the column to which François Bonivard was chained for four of the six years of his incarceration, now etched with the name of the romantic poet who immortalised his story. And sure enough, all around, is a vision of natural splendour so typical of Switzerland– snow-dusted peaks, verdant valleys and glittering glacial waters. The fortress lies just two miles around the lake from Montreux, with its grand dame hotels, broad promenades and incongruous statue of former resident Freddie Mercury. As well as The Prisoner of Chillon, Lake Geneva (in its anglicised form) also inspired Frankenstein and Hotel du Lac – the perfect place to begin a somewhat literary journey around this often maligned country. And there is simply no better means of travel than the scenic trains which crisscross Switzerland. They are comfortable, run like clockwork (naturally) and overcome Europe’s sternest geographical challenges to unite this patchwork nation’s four great cultural regions – French, German, Italian and Romansch Switzerland. Starting in Montreux, the first of these epic rail adventures is the GoldenPass Panoramic to Visp, connecting with the final section of the more famous Glacier Express to Zermatt. A little over two hours of travel along the lake, beyond the Aigle vineyards and through the Rhône and Matter valleys, exposes a stark contrast between elegant, bustling, francophone Montreux and the spectacular alpine village of Zermatt; its traditional wooden chalets and Germanic character, car-free streets and scents of fondue and gingerbread evoking the sense of stepping into a fairy tale. Towering above Zermatt is the unmistakable ‘jagged tooth’ profile of the Matterhorn, a crooked finger beckoning climbers with a magnetic, often fatal allure. The Gornergratbahn, Europe’s highest open-air cog railway, is a rather less perilous ascent to a height of 3km, revealing extraordinary views of ice floes greyed and striated with age like elephant hide, the Matterhorn in all its soaring glory and 28 other 4,000m+ summits arranged in a panoramic guard of honour. West to east runs the Glacier Express, the ‘slowest express train in the world’. If you find yourself seduced by the name, make the journey in winter when the most spectacular stretches are blanketed in snow – but even in high summer it leaves a lasting impression. En route to Davos or St Moritz, the deep Rhine Gorge (‘Switzerland’s Grand Canyon’) and the 2,000m Oberalp Pass are conquered with ease; 291 bridges, 91 tunnels and two World Heritage Site mountain regions are traversed. These days, think Davos – and its near neighbour Klosters – and perhaps you think of the World Economic Forum and the ultra-rich, but it wasn’t always so. At the turn of the 20th century, the town was better known as a health resort, particularly for tuberculosis sufferers, drawn to its high altitude and clean mountain air. A truly fascinating insight into this history may be gleaned with a funicular ride 300m up to a sun-drenched plateau where stands the Hotel Schatzalp. Formerly a luxurious sanatorium, but now one of Europe’s great ‘time-warp’ lodgings, this attractively dilapidated building retains most of its Art Nouveau character. In the grounds bloom hundreds of species of alpine flower, and clouds scud across the sky at eye level revealing in their wake farreaching views of pine forested hills and distant snowspeckled peaks. No wonder Thomas Mann was moved to celebrate the resort and its setting in Der Zauberberg (The Magic Mountain), in which a young engineer intending to spend three weeks in the sanatorium visiting his sick cousin ends up staying for seven years. Mann was not the only author to draw inspiration from the region – the guest book of Davos’ stately Grand Hotel Belvédère includes such names as Robert Louis Stevenson and Arthur Conan Doyle, and just an hour or so north is Maienfeld, the idyllic alpine backdrop for Johanna Spyri’s children’s classic Heidi. 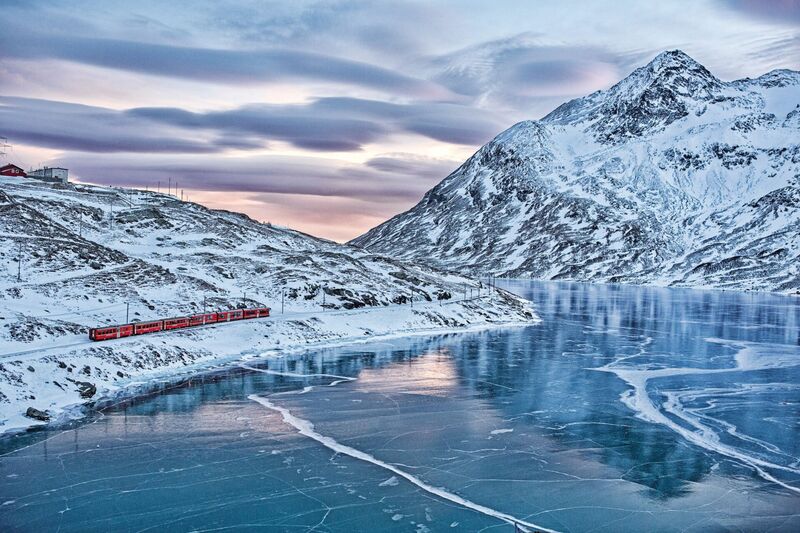 The Bernina Express unites German and Italian Switzerland in a splendid southward journey from Davos recognised as by UNESCO as a World Heritage Site in motion. The first half, by train, climbs high above the pine treetops, past wildflower meadows and turquoise lakes, to the Bernina Pass, then descends into a completely different picture of beauty – all sunshine, orchards and vineyards, corkscrewing viaducts, and towns and villages ever more Italianate in style. From delightful Tirano, just across the border, the adventure continues by luxury coach, through Lombardy’s picturesque Sondrio region and around the shores of stunning Lake Como, re-crossing into Switzerland in the final minutes before Lugano. Resist the enticement of a lengthy stay in the charming resort of Lugano (or nearby Locarno, home to the international film festival) and another great Swiss ‘combination’ journey returns you north. Leaving behind the palm trees and sun-dappled lakes, the Gotthard Panorama Express spirals up the mountainside from Bellinzona (a short local train ride from Lugano or Locarno). 10 minutes through a high altitude tunnel and the landscape is magically transformed once more – brooding timber churches and the smoking chimneys of steep-roofed chalets heralding a return to Germanic Switzerland. Looping down to Flüelen, we exchange rails for waves and board a traditional paddle steamer bound for Lucerne. The pretty historic bridges and buildings of this historic city sit in the benevolent shadow of Mount Pilatus and, if you have time to wait for a clear summer’s day, ascents by cogwheel and cable car to the summit present astonishing lake views. But we have a Swiss grand tour to continue, in the form of the Luzern- Interlaken Express. Trains ply this dramatic route several times a day, accommodating brief stops en route. Meiringen is one such stop; unmissable for Sherlock Holmes enthusiasts, for it is here that the fateful events of The Final Problem play out. The Englischer Hof, where Holmes and Watson stay, is now the Parkhotel du Sauvage, and a funicular leads to the Reichenbach Falls, where the River Aare plunges into ‘an immense chasm, lined by glistening coal-black rock and narrowing into a creaming, boiling pit of incalculable depth’. In this ‘fearful place’, Holmes and Moriarty wrestled to their deaths, or at least (124-year-old spoiler alert!) that’s how it appeared to the distraught doctor. Grindelwald, half an hour by train from Interlaken, is ‘chocolate-box’ Switzerland and so perhaps the perfect final stop of a great rail odyssey. Not least because there is one final, iconic train journey to appreciate– the Jungfraubahn, which cuts through the legendary North Face of the Eiger on its way to the highest station in Europe, set beside the pristine, other-worldly Aletsch Glacier. Here, a palace of ice awaits exploration one tentative step at a time, and a high-speed lift delivers visitors to the Sphinx Terrace for views as far the Vosges mountains of Alsace and Germany’s Black Forest. Switzerland in microcosm, it is expensive, yet also wondrous, unique and undeniably one of the world’s essential travel experiences. Established in 1998 this UK-based company offers general interest, nature and culture holidays from the UK, using rail travel as a theme. Comfort, enjoyment, leisurely days and friendship are the secrets of its success. PTG Tours specialises in countries and areas not covered by other operators. It is one of the few rail holiday companies that is both ATOL & ABTA bonded – the highest accreditation a tour operator can achieve. The majority of PTG’s trips are for people who want to see the culture and scenery of the destination country, travelling by train and staying at great hotels. A regular tour is the renowned ‘Vintage Port’ holiday, which celebrates its 40th trip in 2018. This tour is centered on the Douro Valley in the north of Portugal, famous for its Port wine and stunning scenery. PTG is the only rail company running rail holidays to Cuba, where this paradise island is traversed using a private railcar. Visit the sugar mills to witness ‘real’ workings during the sugar cane harvest. The next tour departs on 16 February and readers are urged to visit before the ‘lost world’ experience disappears. A unique attraction of PTG is that anyone booking a holiday gets a free day out on a steam-hauled charter train covering both the Welsh Highland and Ffestiniog Railways in North Wales. The next trip is Monday 4 June. And for a holiday away from the trains, PTG offers a unique ‘Royal’ Douro River cruise using The Spirit of Chartwell for a seven-night cruise through stunning scenery. This was the boat used by The Queen during the Diamond Jubilee celebrations. As well as their wide range of steam-hauled day-trips and rail holidays within the UK, The Railway Touring Company offers many destinations in Europe, including Switzerland, France, Italy, Austria and Germany, and also ventures further afield to places like Myanmar, Sri Lanka, India and South America. Many of the trains are specially chartered for their tour party, and some travel over unusual routes rarely used by passenger trains. An interesting variety of steam and diesel locomotives representing various track gauges are included. They also include cultural and tourist visits to complement the train travel included in the tour. The Swiss Bernese Oberland tour, with a range of departure dates, is the perfect way to enjoy the delights of Switzerland. A very special tour to India, The Glorious Trains of India from 8-27 March, includes steam travel not available through any other operator, including steam in the Shimla area. In 2018 The Railway Touring Company are offering new tours to Italy, Poland and Hungary. They will also be including a new autumn tour to Switzerland, which will delight participants with glorious scenery and wonderful views. What better way to see the world than relaxed travel on board a train!